The South Perry market returns on May 5. The way we shop for food and the way we eat is changing. If anyone's noticed that more, it's South Perry Thursday Market manager Karyna Hamilton, who says the farmers market has easily tripled in size over the last couple of seasons. Locals come weekly from all over town to the South Perry District, their arms laden with reusable shopping bags ready to be filled with fresh, locally grown vegetables, honey, meat, eggs and more. 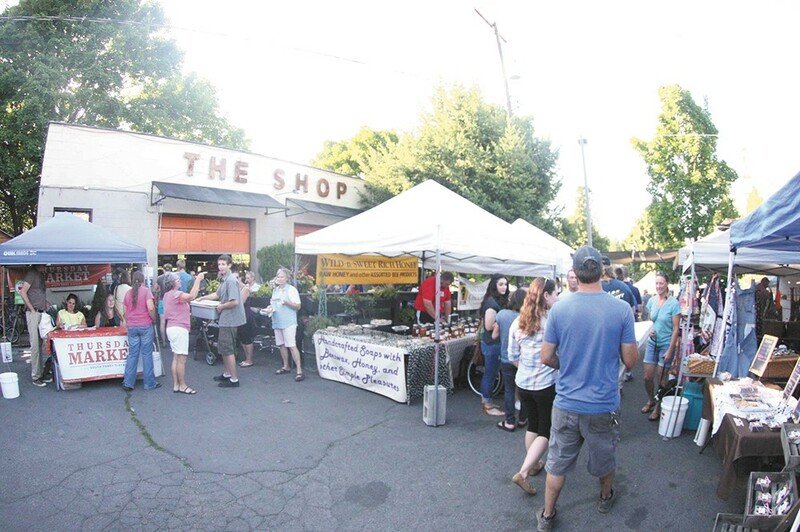 At the peak of market season in mid-June, the parking lot of the Shop cafe, and stretching over to the lot at Grant Elementary, is filled with as many as 50 local vendors. "I think there has been a lot more awareness of the importance of eating healthy food, and an increase in people trying to source that nutrition locally," Hamilton notes. "Perry is kind of special because it's really fun. It's really community oriented, and there a lot of local businesses around." On May 5, the Thursday Market kicks off its 11th season (it's open from 3 to 7 pm each week). It's the longest farmers market in Spokane, stretching through the end of October. While one of the most established markets, it's not quite the oldest — that honor goes to the Spokane Farmers Market at Fifth and Browne (founded in 1998). Yet, Hamilton says the success of the Perry market has definitely influenced the rise of more weekly markets in other Spokane neighborhoods. "Perry has this really special thing that happens. It's on the brink of a very low-income area, and there is affluence just up the hill, as well as it's a destination. But it always comes back to community. There is a really diverse group who come together for this really pure purpose and have a really fantastic time," Hamilton explains. "I think other markets are trying to recreate that sense of neighborhood and identity." Besides offering quality, nutritious food, the Thursday Market has notably been the birthing ground of many local businesses that have grown into successful, regionally known ventures. Winterwoods Tea Company, which has gained widespread recognition, along with Fannie's Ice Pops, Flora Yogurt Company (Hamilton's business, which she started after getting involved with the market) and Veraci Pizza all got their start at the Perry market. "A lot of things start and grow at the Thursday Market that contribute to the uniqueness and culture of Spokane as a whole," Hamilton says. "It's a beautiful, perfect relationship."